MANILA, Philippines - State weather bureau PAGASA on its 8:00 p.m. update today, July 29, 2016 announced that 'Bagyong Carina' maintained its strength as it moves in a Northwest direction. At 7:00 p.m. today, the center of Tropical Depression "Carina" was estimated based on all available data at 115 km East Northeast of Borongan City (12.0°N, 126.4°E). 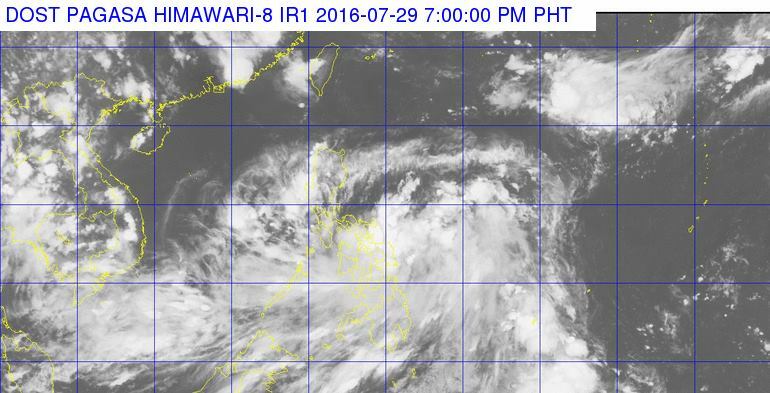 'Carina' has maximum winds of 45 kph near the center and it's forecast to move Northwest at 11 kph. Tropical cyclone warning Signal (TCWS) No. 1 (30-60kph) was raised over Catanduanes, Northern Samar, and Eastern Samar and Samar in Visayas by the weather bureau. The estimated rainfall amount is from moderate to heavy within the 300 km diameter of the Tropical Depression. Fisherfolk are alerted against moderate to rough seas over the eastern seaboards of Luzon and Visayas. Areas under TCWS #1, the rest of Visayas and the provinces of Albay, Sorsogon and Masbate are alerted against moderate to heavy rains which may trigger flashfloods and landslides.